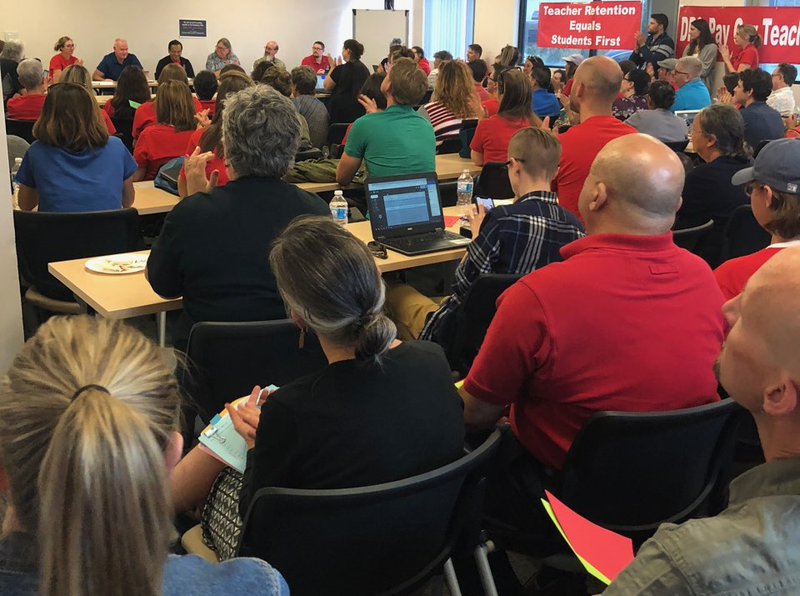 At last night’s public bargaining session, DPS doubled down on its proposal to reform teacher compensation by increasing one-time bonuses amid the nearly constant outcry from more than 100 educators in the room. They presented two scenarios. The first was the same proposal they shared in June one that would emphasize the unpredictable and unstable status quo of our current ProComp by forcing educators to rely on one-time bonuses, many of which are completely out of their control. Despite the demand from educators to increase base pay and lower one-time incentives, the District has proposed increasing incentives. Their second scenario is contingent on the passage of Amendment 73 and adds more funding for teacher compensation but still relies very heavily on one-time incentives and unpredictability. The District claims that the last DCTA proposal would add over $30 million to the teacher/SSP salary budget. However, they did not have any answer to the question of why, when they say DPS will add $36 million to the budget is A 73 passes that they didn’t accept the DCTA proposal that would give teachers/SSPs a far greater base salary than what DPS is proposing. They also had to admit that they would NOT place current teacher/SSPs where they should be on the new salary schedule but would only place them on the nearest place to where they currently are. This means that current teachers would NEVER catch up to new hires who would benefit from their proposed salary schedule. Click here to see the District’s proposals. Teachers and SSPs worked for hours to understand the district’s thinking and their prioritization of current funding. Despite open dissent, DPS insisted that teachers and SSPs in Denver want a performance pay system and they refused to minimize bonuses in favor of a higher base pay. By the end of the bargaining session the DCTA bargaining team called an impasse. Future bargaining sessions will be held publicly, with the assistance of a mediator. The goal of working with a mediator is to settle the fairest compensation system for DPS educators; however, the declaration of impasse brings us one step closer to a strike vote in January. Stay tuned for more details about the selection of a mediator and the location and time of future bargaining sessions. Participation in mediation supports the overall escalation toward a strike, should it become necessary, by demonstrating to the Department of Labor that DPS teachers are making a good faith effort to bargain with the district. DPS won’t take teachers and SSPs seriously until we show them we’re serious. Now’s the time to get involved in the effort to professionalize pay in your school district. Join us at our next bargaining session and join us on Colfax October 5!